"Traumhafte Lage, herrlicher Blick aufs Meer. Badegelegenheit, köstliches sizilianisches Restaurant und Läden in der Nähe. Die Wohnung wird auch von den Eigentümern benutzt und ist persönlich eingerichtet. Man kann die Wohnung nutzen, als wäre es die eigene. Grosser Nachteil: Die Küstenstrasse(Via Aurelia) führt direkt unter dem Haus vorbei. Viel Verkehr, vor allem Motorräder. Deshalb die Note 3 bei der Umgebung und eine bedingte Weiterempfehlung." Sunsets were superb. I had no car but the apartment is very very close to 2 bus stops and about a 10 minute walk to the train. Wish I could go back in the summer as there are 2 awesome swimming spots. Great owners very accommodating. Only negative was limited internet access but it seems that may get better soon. I lived there for 3 mos so internet was more important than it would be for a vacationer. The apartment has a lot of charm and feels like the family home that it is. It is perfectly situated giving easy access to trains and buses to visit the lovely area and Genoa. I swam throughout the month of October at a lovely cove with spectacular cliffs which is a 5 minute walk from the apartment. It is one of the rare typical Ligurian homes I found that offered a terrace and the view is amazing, especially the spectacular sunsets, though the road in front can be noisy. The best thing about the apartment is the owners who are beyond kind and thoughtful in every way. I feel like I have made not only wonderful memories but also wonderful friends. First, the geographical situation of Pieve – between the scenic Ligurian countryside and majestic Genoa – is a very good compromise for those who seek to explore both. Then, the apartment itself is indeed full of charm and authenticity, with a truly breath-taking view. It can be a bit noisy due to the adjacent road, but it’s fully tolerable. Every facility one would need is in a walking distance from the apartment – excellent restaurants and fine grocery shops, animated cafes, a beach. One of the best things about this rental, though, was its hospitable owners, very considerate and flexible people. Our family of four enjoyed a two month stay in Pieve Ligure in September and October 2013. 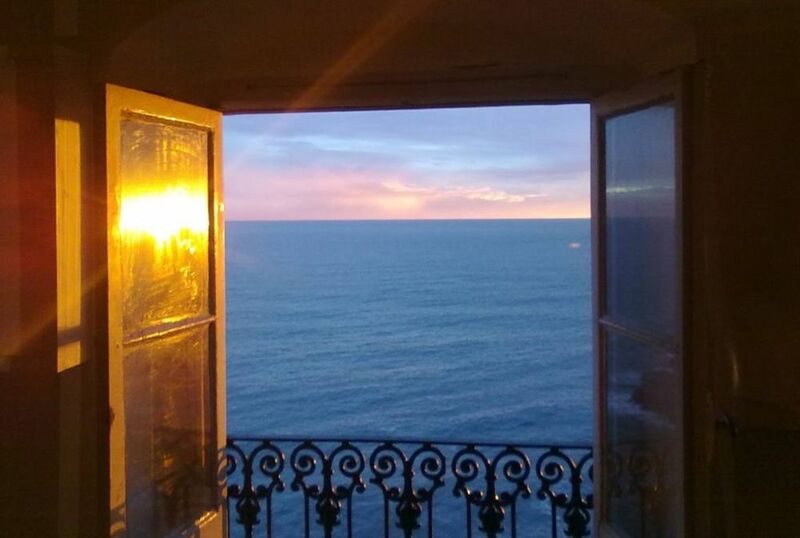 The apartment has lots of character and the view of the sea from the apartment and the terrace are gorgeous. I will never forget that view! The beds were comfortable and we had plenty of linens and towels. The kitchen was very well equipped, only missing a microwave. The apartment is within walking distance of small and large grocery stores, restaurants, a rocky swimming hole, and nice beach in Bogliasco. You can take the train from Pieve and explore the rest of the amazing Ligurian coast. My children really enjoyed the toys and books provided and the large terrace space. We all loved the delicious Italian cuisine! The owners are friendly, generous, and helpful. We couldn't have asked for more. "Great apartment - full of character, charming and quirky - beautiful views, loads of equipment for cooking and essentials left to use. Practical location for non drivers using public transport. Extremely generous, flexible and and welcoming hosts - went out of their way to accommodate us and made us feel really welcome. Cannot recommend more highly - 5 *s all the way! Thank you so much!"